Keep your electronics charged up no matter where you are. 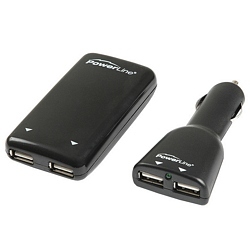 This kit includes both a wall charger and a car charger... and each features dual 500mA USB power-only outlets. The AC adapter is suitable for worldwide use and includes folding prongs for easy travel. The DC charger is ultra compact and works with both 12V and 24V systems. USB cables not included.